While we were wrong that it isn’t a phishing scam, it never hurts to be extra cautious when dealing with secure passwords and strange emails. Especially ones that say funds have been sitting in our wallets for “six months or more”, when we spend money on the PlayStation Network weekly. Simply put, we were wrong, but it’s better to be safe than sorry. [Original] The PlayStation Network has been the target of a number of hacks, schemes, and some other downright dirty acts from scoundrels, thieves, and evil-doers alike. 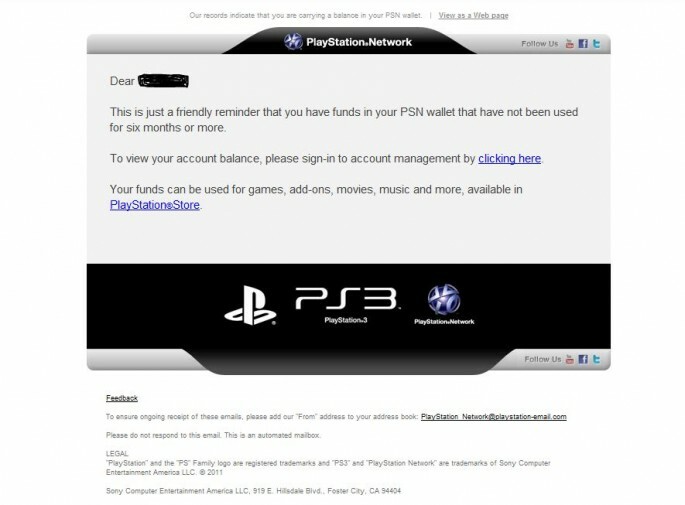 The latest issue comes in the form of a phishing scam being sent to PSN user’s email addresses. The scam appears as an email stating you have funds in your wallet that haven’t been used in months. Upon logging in, your credentials are then stolen. I personally received the email late last night and although it did raise red flags, there were things in the email that made it appear legit. As you can see from the image below, there is legal copyright and trademark text at the bottom of the page. It also is designed in such a way that it looks similar to other PSN-related mailings. It does appear that the scam at least knows half of your information as it uses the correct PSN ID and send the email to the email address related to the PSN account. All that’s left is for you to enter you password, and they’ll have all they need to do their dirty work.